So having discovered my phone has a slow-motion option on its videos, I’ve been playing with it a bit. This short clip shows how I splatter paint, a technique I use a lot for my sheep and seascape paintings. It’s a “happy accident” technique you learn to control through practice. The consistency of the paint is crucial, and that you learn through trial-and-error. If you don’t see the video above, click on this link. The quality of the video isn’t brilliant because it was done late afternoon in low winter light. And imagine my phone balance precariously on my tripod, held by various bulldogclips. Perhaps I ought to set a Patreon goal that relates to better video equipment? As sometimes happens, I lost the plot. 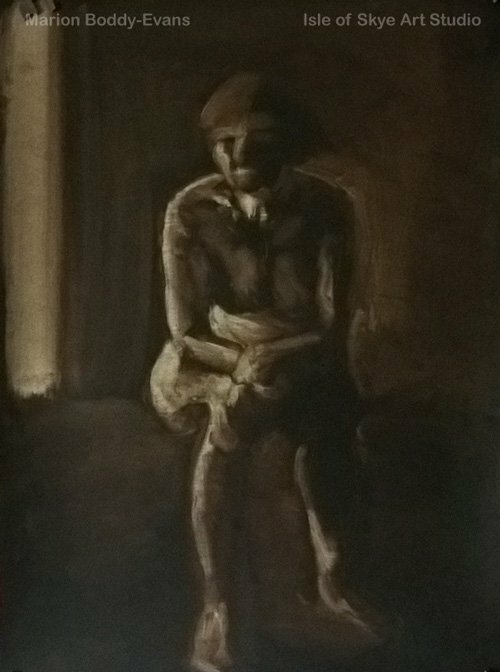 I was doing a little studio study based on my sketches and previous paintings of the River Rha, and at some point I lost too much of the dark and ended up with mid-tone mediocrity and brushwork blended to blandness. I’d started on a sheet of dark-charcoal pastel paper* that could’ve served as the dark , but painted out too much of it. (*Full disclosure: it wasn’t a carefully considered choice but simply the sheet of A2 that came to hand in a portfolio bag of mixed papers.) 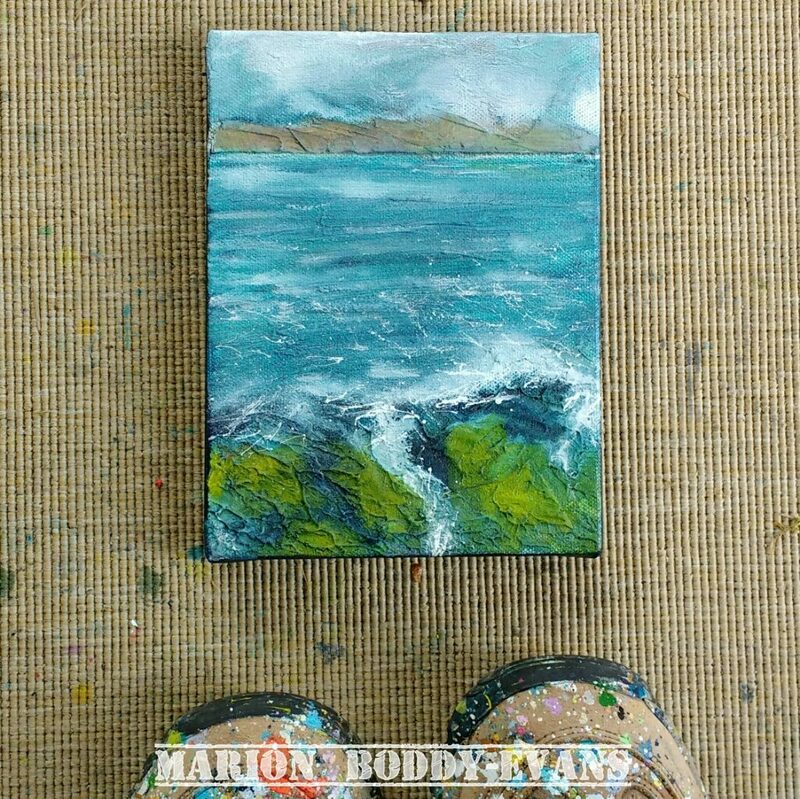 I was frustrated with myself, with what I’d done with a brush, so instead of continuing to paint I decided to change mediums, which can be a bit like changing gears. I reached for some oil pastels to redraw a layer of line and hopefully reinvigorate the painting. Once I’d re-found the joy in the piece, I painted the stream a bit more. I don’t consider it a finished piece as there’s a disconnect between the stream and the rest. 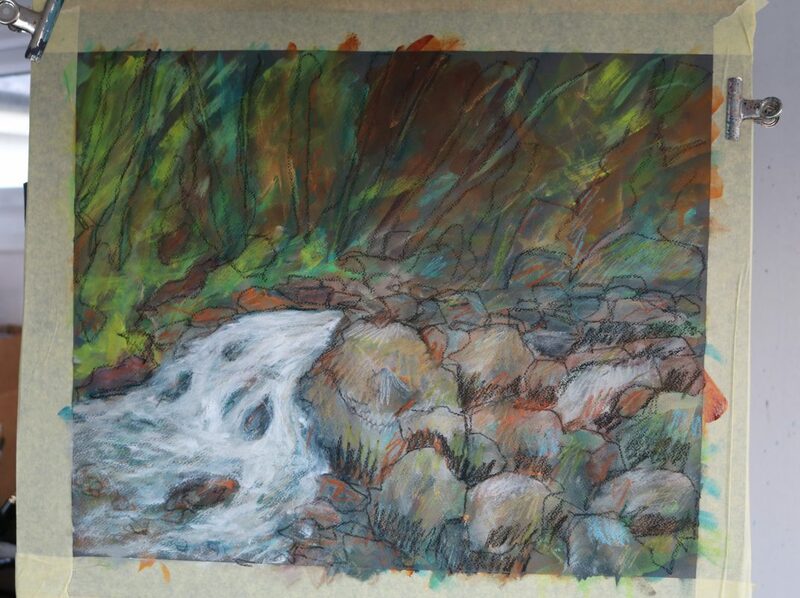 But I know where I would go next if I do decide to continue working on this: a layer of paint over the rocks and background, add a suggestion of stream to the right, bit more water-colour that isn’t white to the stream and a flick of splatter. Why might I not continue with this painting and finish it? Well, it was a warmup, an excuse-for-playing-with-colour moment, a do-something-so-you-feel-productive piece. It might take a little to resolve it and it might take a lot. It might already have served its purpose. I left it taped to the board for now. I’ve had requests to explain a bit more about my painting process (hence this is called #1). It’s an edifying, albeit slow, process nailing down what I do and why. It doesn’t always make sense to me, even as I realise I’m doing it, but then evolution isn’t necessarily logical or sensible (think: furry creatures that eat very specific leaves only). I admire artists who work strongly with warm and cool colour*. I know the theory. I’ve tried doing it slowly and conscientiously. I’ve drawn myself little diagrams of what part of a composition should be warm light and warm shadow, cool light and cool shadow, and still blown painting it thus. 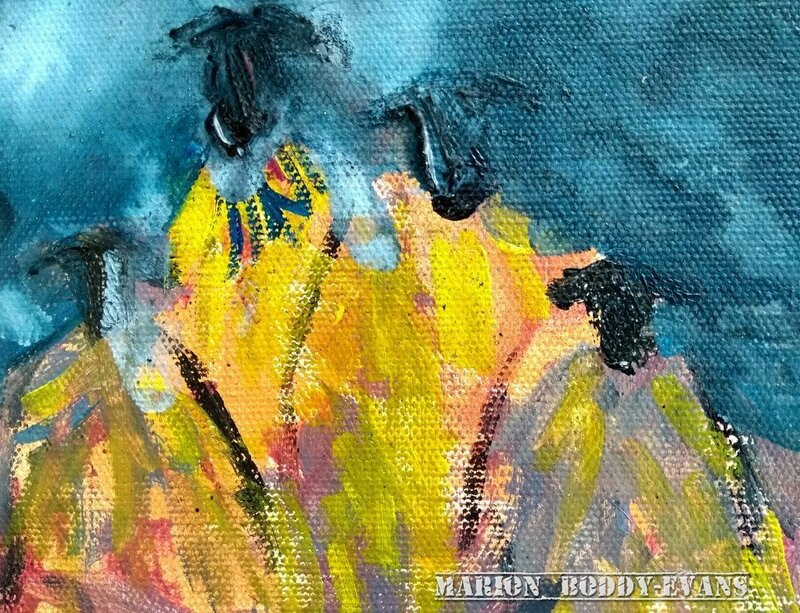 I put warm into cool areas, make distant hills darker than nearer, and choose between lemon yellow and cadmium yellow based on transparency not warmth. I could blame all the “soft northern light” on Skye, but that doesn’t hold for not doing atmospheric perspective in a painting. And Monet said the light in Algeria taught him to see colour so all my years under a southern African sky should surely have imbued me too. Most of the time I don’t about consciously think warm or cool, neither the lack thereof nor the using of it. Will it always be thus? I don’t know. *Such as Alan McGowan in his figure painting and Michael Chelsea Johnson in his landscape paintings. **Prussian blue, phthalo blue cyan, phthalo turquoise, cobalt blue, cerulean blue, lemon yellow, cadmium yellow light and medium, cadmium orange, magenta and titanium white. If you’ve been on one of my painting workshops, you’ve probably heard me say “dance in a line”. I hope these photos help explain what I mean. 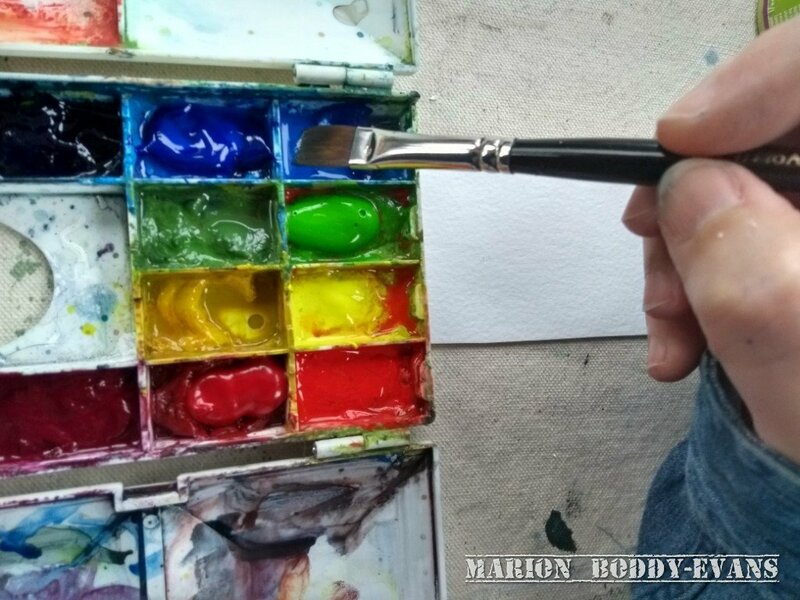 Hold the brush at the tip of the handle, so you’ve maximum movement in it from the wrist. Move quickly and light-heartedly, without overthinking, as you’d do a twirl. 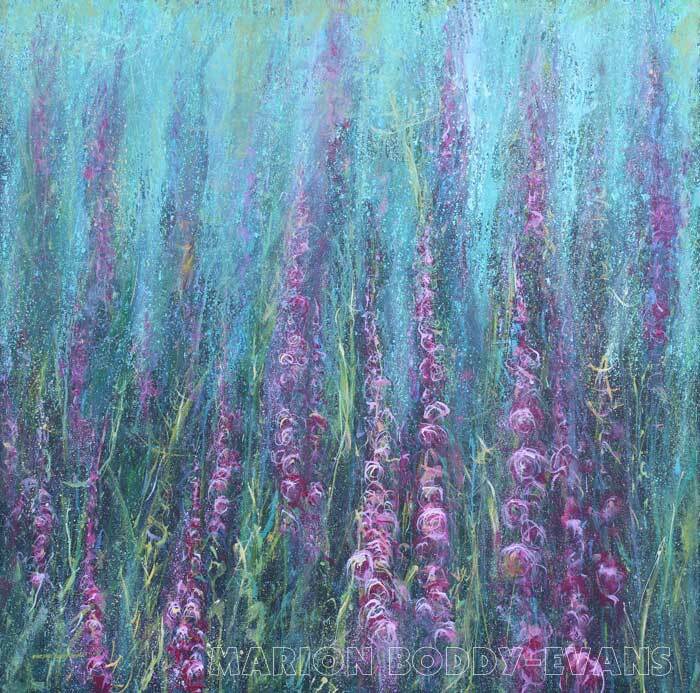 The line I’m dancing in here is intended to ultimately become part of a foxglove in the foreground of a sheep painting. My “Ascending Pinks” (below) is full of these danced lines. Ascending Pinks. 100x100cm. At Skyeworks Gallery. ?695. Context: Thinking about visible brushmarks or mark making in a painting rather than blending and smoothing out all brushmarks, about the things that influence brushmarks. 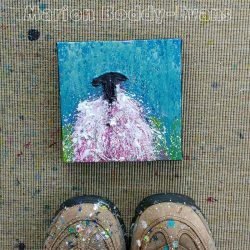 This is what typically happens beneath the final ‘wool’ paint layer sof my sheep. You ultimately see just specks through the ‘wool’, but without it my sheep look flat to me. If you’re wanting to paint neatly up to an edge, say the side of a vase or tree trunk, painting away from that edge or imaginary line rather than towards it is easier. 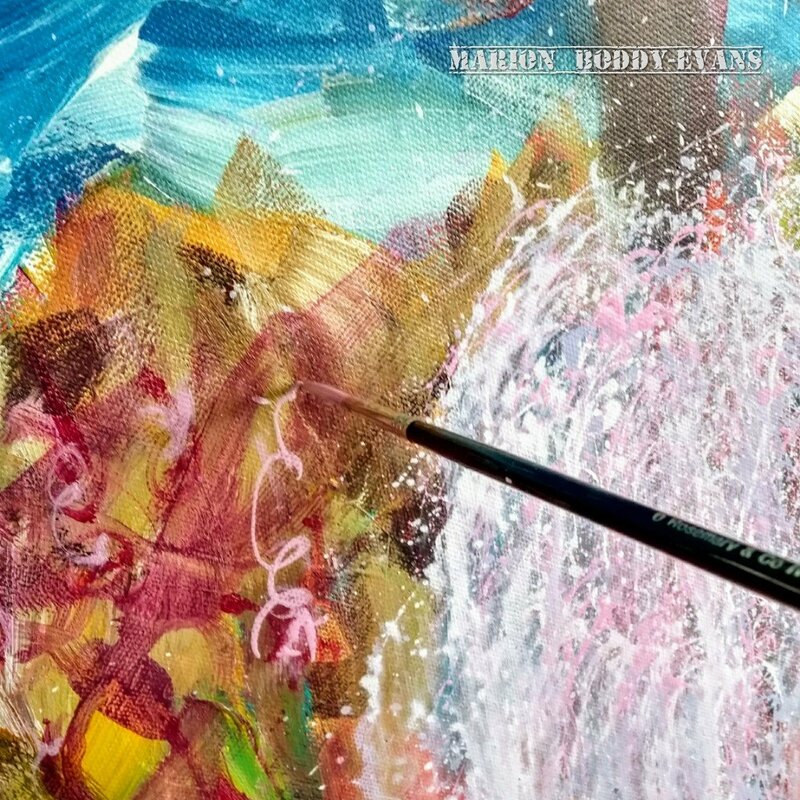 You position the brush at the exactly the right point when you start, then move the brush away from the edge. If you’re painting towards it, you have to decide when it’s time to stop. Lift the brush too early and there’s a gap; leave it too late and you go over the edge. Whereas wet-into-wet can be a tightly controlled technique. It all depends on how you wet the paper and how you apply the paint. It also shows how a good flat brush gives you a very sharp edge or line and control. Note too how I’m using my little finger to steady my hand on occasion; it’s not something I consciously do, though I know I do it only if I’m painting sitting down. Sometimes I find myself reminded of a painting technique I know is useful but neglect to use often enough. This week it was painting the negative space (the shapes around an object or subject) using an opaque colour. I was doing it with someone who’s relatively new to painting, and in the process found myself wondering why I don’t use it more often. 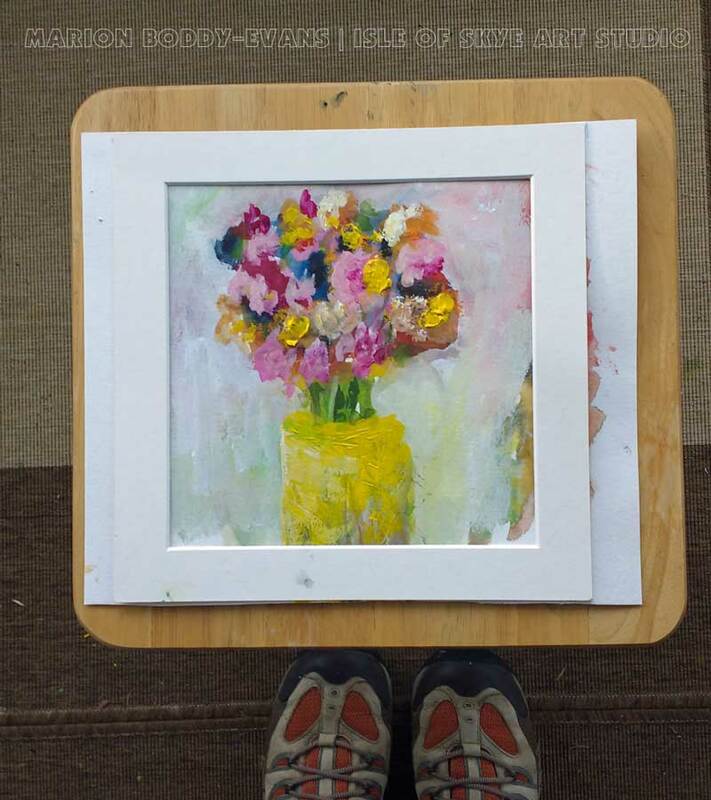 In this instance I used titanium white to block off the negative space around the “flowers in vase”. Doing so also reminded me of oxide red, an intensely opaque colour I encountered in a figure-painting workshop I did with Alan McGowan and is on my “try again” list of colours. Now I just need to find out where the tube of it I know I have is. (a) I’m not using a stay-wet palette with acrylics so too much of such squeezed-out paint would dry before I’d used it all. (b) I don’t decide on all the colours in advance (though I do have regulars). (b) I don’t use all my regular colours in every painting. 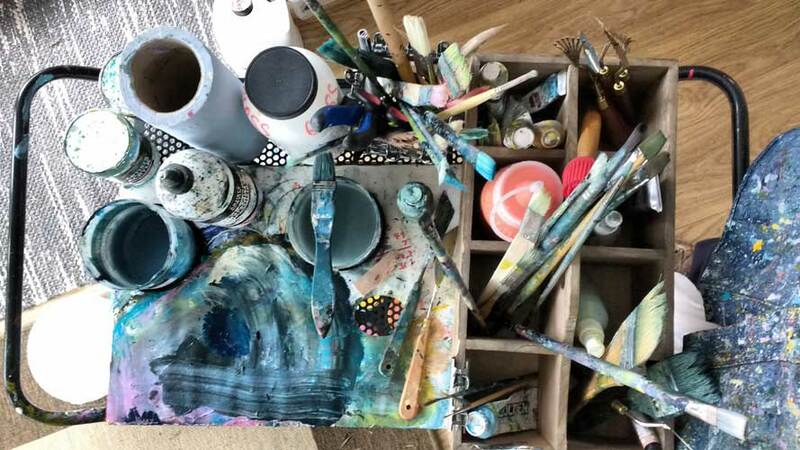 (d) I work with one colour at a time (single or mixed), applying it across the whole composition before moving onto the next, working with the fast-drying of acrylics, not against. 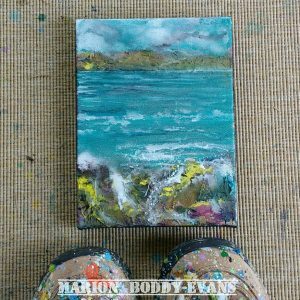 Any leftover gets used to build up coloured grounds on a small canvas, so it’s not wasted. (e) I like colour-mixing through layering and glazing. 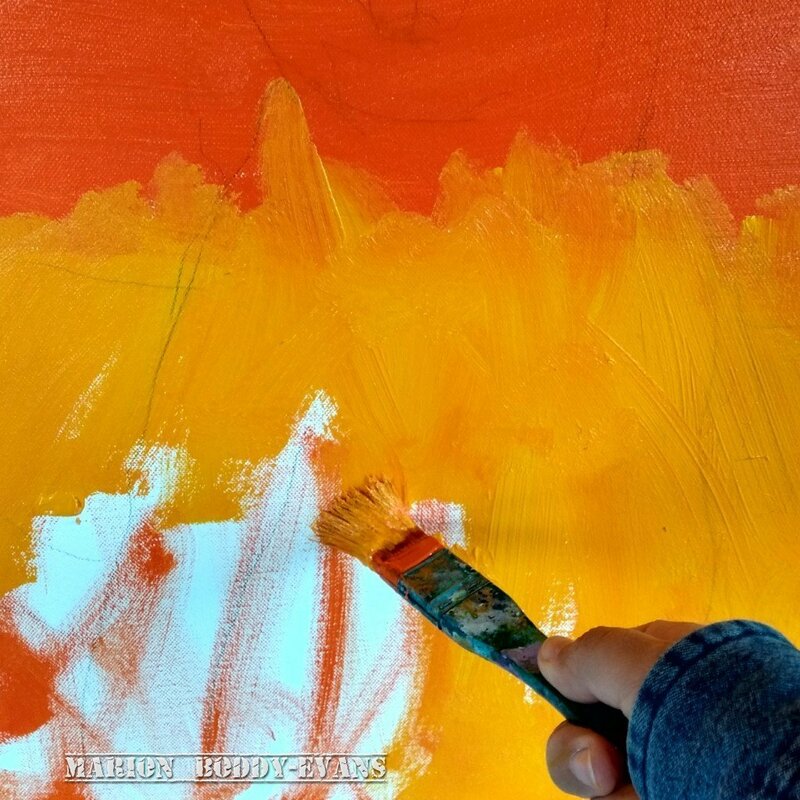 (f) I often squeeze paint (and medium) directly onto a canvas, particularly in the initial layers of a painting. (g) There’s less wet paint for studio cat to jump onto. 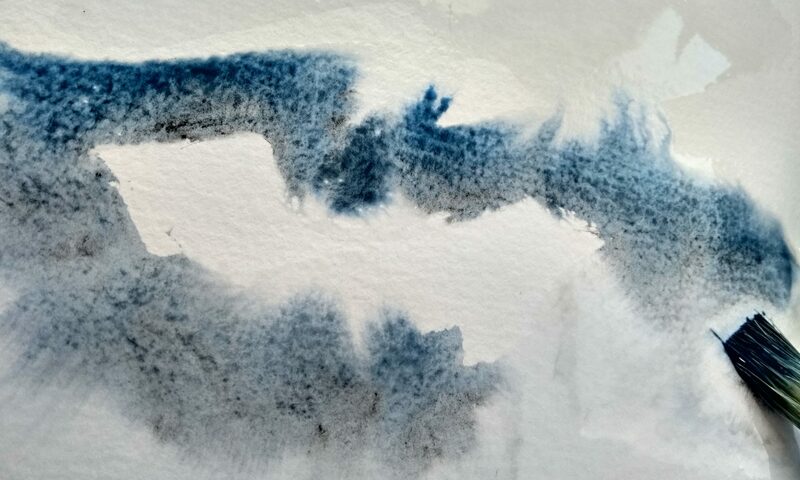 My palette is a small mixing area that reflects the last colour I used, in the photo it looks like “sheep black” over Prussian blue over cobalt teal. I wipe the space if the next colour doesn’t want any traces of the last in it. It’s not a pretty, photogenic palette, but it works for me. If painting in monochrome seems a strange thing to do given all the paint colours available to us, think for a moment about how beautiful and powerful black-and-white or sepia photographs can be. Likewise paintings done with black ink only. We don’t feel a lack of colour when we look at these, yet when thinking about painting with only one colour our instinct is often to feel that we’re missing out somehow. Colour: burnt sienna mixed with Prussian blue to create a deep, rich brown. Only one colour to deal with, so you really get to know its characteristics and what it does (opacity, transparency, tinting strength). Helps you focus on tone without the distraction of colour. Reminds you that less is often more: tone is often the solution to a problematic painting rather than colour. Encourages patience and persistence (because you can’t distract the viewer with colour and have to fix things). No wasted paint from colour-mixing mistakes. You’ve only one brush to wash (unless you’ve used various sizes). You can add the art term “Grisaille” into your vocabulary. Gives you the chance to pretend you’re Rembrandt, working in dark moody browns. Monochrome doesn’t mean it has to be a tube colour, you can mix a colour. Consider using a coloured ground (in a light tone) rather than working on white. Transparent pigments are more versatile than opaque for this. 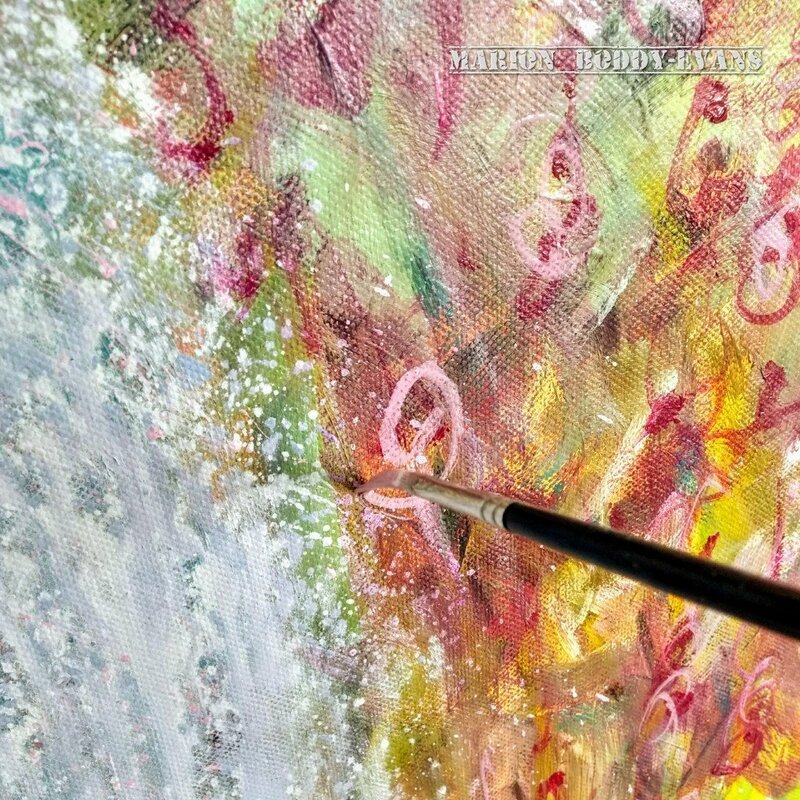 Using the white of the canvas/paper gives a different result than adding white paint. Zinc white is more transparent than titanium white (which is a very opaque pigment). Discovering how much can be achieved with only one colour is a step on the journey to discovering the joys of working with a limited palette. Using fewer colours but ones that you know intimately will produce better paintings than using lots of colours. It adds a cohesion as the colours work with one another across the whole composition.